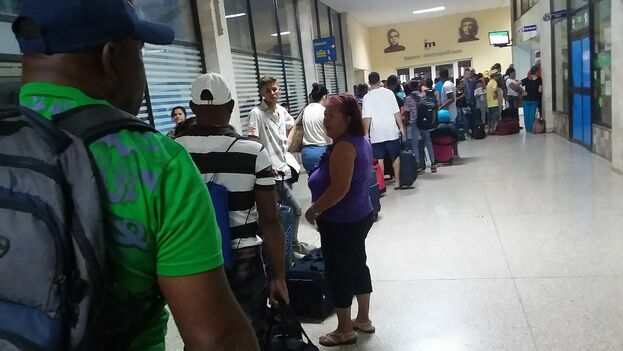 14ymedio, Ricardo Fernández, Havana/ Camagüey, 6 March 2019 — A long line of passengers loaded with bags, boxes and suitcases wait at Havana’s Central Bus Terminal to pay for excess baggage. The traditional practice of carrying large quantities of food on the bus routes is now allowed, although the cost is too high for the travelers. Since the beginning of the year, with the implementation of a resolution of the Ministry of Finance, it is now permitted to travel with more than the 20 kilograms of free luggage (10 in the case of children) that is allowed when paying for a regular ticket. What was previously prohibited, was at that time dealt with by dropping some bills into the right hands. Now that it is regulated, it is difficult to do because of the high price. 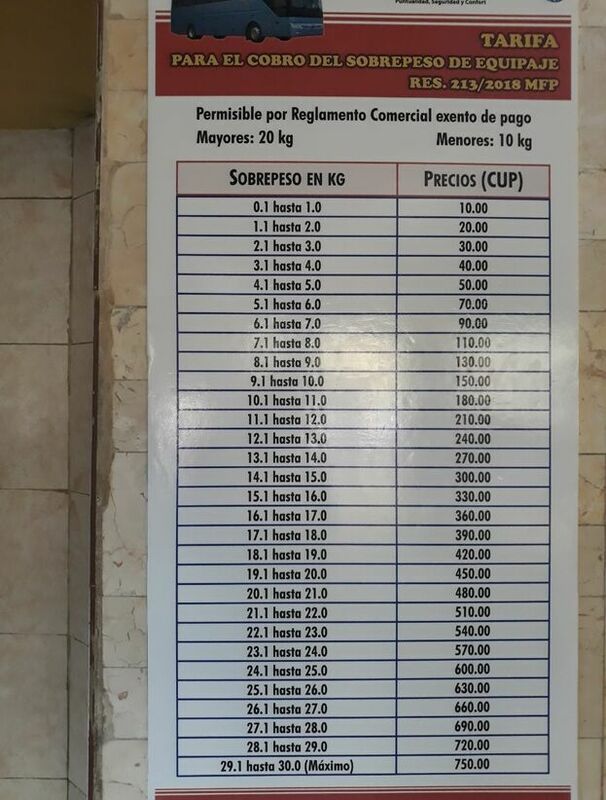 Each adult who wants to add weight to their luggage must now pay between 50 CUP (Cuban pesos,roughly equivalent to $2 US) for 5 kilograms and 750 CUP for the maximum allowed, 30 kilograms. The figure can reach up to ten times the price of the ticket. “I have two brothers imprisoned in the Taco-Taco prison in Pinar del Río, and when I visit, I bring food to both of them,” says Carlos from Camagüey who frequently visits from the middle of the island. In February, I had to pay 300 CUP for the overweight luggage, the cost of my ticket was 33,” he explains incredulously. However, for those who need to bring food home to their family, or bring food to a family member who is a prisoner, or move around the country with their belongings in hand, the price has turned out to be excessive. In this service, it is precisely the people with the fewest resources who can not travel by private taxi lines. Alicia Fuentes travels abroad as a “mule” to look for merchandise that she later sells in the informal market. According to her experience, she says, Cuban rates are proportionally the highest. “In all the time I have been traveling to countries that do not require a visa for Cubans, the cost of bringing packages does not exceed 25% of what I paid for the passage. Now, when I arrive at the bus terminal in Havana, I have to pay 750 CUP for luggage, almost eight times more than the ticket,” she says. “It may be that in airports charging for overweight luggage is more justified, but we are talking about a transport that moves by road,” says Fuentes, who does not understand that excess weight can pose a risk to passengers. The Chinese-made Yutong brand bues destined for interprovincial transport have been suffering from the deterioration of their years and the lack of spare parts. Scenes of these vehicles broken down in the middle of the road are common and last December two of this company’s buses were in crashes that left several dead and dozens injured. It is common for bus customers to trvel with products bought in one province and scarce in another. In bus luggage compartments often carry the purchases from the rationed market made by people who live in one place, but are registered with a ration bodega in another place. “Every month I bring my daughter the rice they give her at the bodega (ration outlet) in Ciego de Ávila because she has not been able to use her card with an address in Havana and she still is registered in the ration system there,” says Rita, a 68-year-old retiree. “With the rice, the jam the child [has a right to] and whatever else I bring, I already have excess baggage and this week I had to pay more than 200 CUP to take it,” she added. Before, Rita managed to bring all her bundles by “talking to the driver and coming to an agreement,” she explained. But she acknowledeges that the other passengers who traveled lighter complained that their bags were crushed by the excess luggage crammed in the compartments. “I can clearly see that the excess baggage is regulated and that you officially pay to carry more cargo but the prices have no relation whatsoever to salaries and, practically speaking, I live only on my pension,” she protests. Others have found a way to evade the high rates. “There are always good people,” says Dignora González. “At home I weigh the bags and separate the excess, so I can give it to someone who isn’t carrying any luggage and we make an agreement between ourselves,” she says, despite knowing that, by decree, the weight is non-transferable between passengers. “The drivers have no way of knowing,” she concludes.